Help us map out the best salted egg dishes in Singapore! Salted Egg Shiok is back! Watch this space as we unveil more fun activities and check out the monthly prizes that your diners can win from now till December 2018! 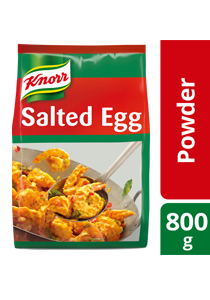 In 2017, Unilever Food Solutions Singapore has launched Salted Egg Shiok, a mission to celebrate the love of salted egg in the country. Salted egg dishes from various F&B outlets were pinned on our Salted Egg Shiok map so that diners who love salted egg creations can easily find and try them. Just like last year, compiling all the salted egg goodies in Singapore is a monumental task that we can’t accomplish alone. We need you to join the movement, and share the goodness. Put Your Restaurant on the Salted Egg Shiok Map! Chefs and restaurant owners, we’re looking for salted egg dishes around Singapore - and if these yummy delights are in your menu, we want to make your dining establishment famous! After registering, watch this space or visit the UFS Singapore Facebook page for more updates as we unveil the other exciting activities we have planned for the year. The publicity generated from this campaign is part of a joint promotion with the Restaurant Association of Singapore (RAS). Your listing in our Salted Egg Shiok map is 100% free, so you’ve got absolutely everything to gain by joining this movement! Diners will be in for a treat as they devour their favourite salted egg dishes. Throughout the campaign, we’ll be enticing salted egg lovers to visit the restaurants and eateries on our map, try the dishes, then shout about it on social media. With luxurious staycations and vouchers to be won every month, what’s not to love? To see how your diners can win by promoting your salted egg dishes online, click here. Need some inspiration to take your salted egg creations to the next level and really showcase your restaurant to Singaporeans? Take a look at these inspired salted egg food pairings and recipes, recommended and created by top chefs in Singapore. Be a part of the Salted Egg Shiok movement, and share your most shiok salted egg dishes with hungry diners around the island!